Ask either of our kids what they want to be when they grow up and the answer is unanimous. They both want to be scuba divers like dad. Dad is what those in the know about scuba commonly call a "gorilla diver" with certifications aplenty and hundreds of dives logged. Mom's a wanna-be diver too. Dad knows the most pleasurable way to get certified is while vacationing in a tropical paradise where the water is clear and warm (we live in California where the water is neither). The problem for us -- and for other dive-loving families -- has always been where to dock the kids while mom and dad are "on the bottom." Sure, the Caribbean is lousy with family resorts that will provide child care while we're out to sea. But what we really want is to bring the kids along with us. What's a family to do? Well now there's an answer. Until very recently, none of the major dive training organizations offered scuba classes and certification for kids younger than 12. But to our amazement and delight, that rule has just changed. SDI (Scuba Diving International) has just lowered their minmum age for certification to ten. And one dive operation in particular has become the premiere spot in the Bahamas for true family dive training and underwater adventure. Grand Bahama Scuba is an SDI-affiliated training center in Freeport, Grand Bahama. In addition to adult dive certifications, Grand Bahama Scuba offers SDI's Junior Open Water Scuba Certification for 10 and 11 year-olds, plus controlled dive training activities for 8 and 9-year-olds. This is a brand new concept in the scuba world. It's a great way for the whole family to literally get their feet wet in this exciting sport which now surpasses even snow skiing in popularity. Grand Bahama Scuba taught our two 10-year-olds to dive the SDI way, which leans more toward actual physical dive skills than math and physics. Gone are the traditional dive tables and calculations which still baffle most adults. Instead, SDI students learn to use dive computers as part of their training. Special computers for kids diplay bar graphs instead of numbers, so they catch on quick and can learn to make safe ascents. All youngsters complete a pool training program first, just like grown-ups. Then dive instructors take them to various controlled open water sites, both inland and on a shallow offshore reef. The 10 and 11-year-olds continue a graduated program of water activities, qualifying them for their Junior Certification. 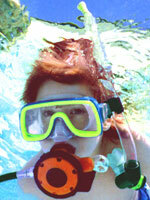 SDI junior scuba divers can then make dives to depths of 35 feet when accompanied by a certified diver age 18 or older. Other certification agencies are following SDI's lead and modifying their curriculums to include younger divers as well. In keeping with this trend, manufacturers are now making quality scuba gear in kid sizes. We found Grand Bahama Scuba well-stocked with gear for the munchkin market, such as good brand-name masks, fins and snorkels. More important, there were buoyancy compensation vests in XS and XXS sizes for our little guppies, as well as smaller, lighter 50 cu. ft. aluminum scuba tanks that kids can wear with ease. We should stress that scuba diving can be a very strenuous sport and frightening even to adults. Only adventurous, ultra-responsible kids who are very comfortable in the water should be considered for Junior Certification. If your kids were swimming before they could walk, like ours were, they'll be naturals for this. Otherwise, don't even think about pressuring them into it. Grand Bahama Scuba is located in a gated resort community offering full apartment rental packages for vacationers. Dive professional Fred Riger and the rest of the talented staff operate two comfortable, diver-friendly boats that take you on daily one and two-tank excursions to popular sites. There are dives to challenge the skills of all experience levels. One and two-tank dives are competitively priced at $35 and $60 respectively, and there are 3, 4, 6 & 10-dive packages for even greater savings. The SDI Junior Certification course runs $350, as does the basic Open Water Certification course for grown-ups. Price includes books, rental gear and five open water dives (a steal of a deal -- you probably can't get certified for that where you live). While our two little aquanauts were busy getting their Junior Certifications, we completed mom's certification dives and headed for deeper waters. Mom's favorite dive of the week was Shark Junction, a world-class shark grotto populated by sleek Bahamian reef sharks. Dad's pick was a more advanced 100-foot descent to Theo's Wreck, a sunken freighter perched on the edge of a drop-off. We then joined our newly certified junior sea hunters for some quality bottom time as a scuba family on the shallow reef. We even took underwater photos and video to show relatives and friends back home. Grand Bahama is served by a number of airlines, including American, with direct flights from major U.S. cities. The mailing address for Grand Bahama Scuba is Box F-42809, Freeport, Bahamas. Phone (242) 373-6775. Their website is located at www.grandbahamascuba.com. You can e-mail them at fred@grandbahamascuba.com. Terri Mandell & E. J. Campfield are travel writers and parents who live in Los Angeles. Copyright ©2000 byTerri Mandell & E. J. Campfield. All rights reserved.